It's the summer of 2004, and the United States seems to have crested a grand new era for documentaries. From "Bowling for Columbine" to "Capturing the Friedmans," from "Winged Migration" to "Spellbound," the new millennium has witnessed the expansion and wider acceptance of the genre. No summer blockbuster managed to generate the advance buzz of Michael Moore's 2004 release (with some help from the grumpy, politicized Europeans on the Cannes Festival jury, the cold feet of Disney, who prohibited subsidiary Miramax from distributing the picture, and a reported $10 million marketing budget-the biggest ever for a documentary). 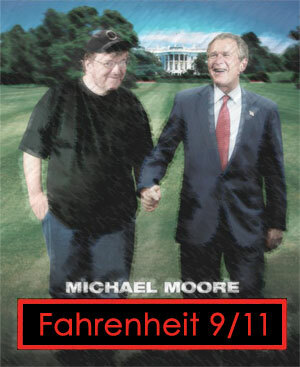 "Fahrenheit 9/11" opened with great fanfare across the U.S. on June 26, 2004. It grossed $8 million on opening night, and as I write this, three nights later, news reports peg it as the number one film in the country its first weekend. It broke the record for biggest gross for a film opening on less than 1,000 screens (the record holder was "Rocky"), and had a higher per-screen take than "The Passion of the Christ" on its opening weekend. It remains to be seen whether the initial hue and cry of critics and commentators will inspire or sway the average moviegoer, let alone the electorate. But to have the country buzzing about truth or satire, accuracy or lies, war or regime change (overseas or at home) instead of the latest special effects extravaganza, leather-clad fantasy figure, wizard-in-training, or J. Lo and Marc Anthony, is a welcome change from summers past. For anyone who wasn't paying attention to the media blitz, Moore's 2004 film is about how the U.S., and in particular the Bush Administration, reacted to 9/11, both at home and abroad. It begins with a reverie about most of the major news networks announcing Gore as the winner in Florida, the candidate and supporters celebrating that victory . . . and then the cold light of dawn and possible trickery. Moore recounts young W's history as a failing businessman whose friends regularly awarded him more money and board seats, and the Bush family's historic connections to Saudi oil money and the bin Laden family, then ranges across the diversion in Afghanistan, the war in Iraq, the hideous ironies of Homeland Security and the Patriot Act. The genial but relentless filmmaker returns once more to one of the ongoing characters in his films—his home town of Flint, Michigan—to illustrate how working class, middle America has sacrificed its sons (and increasingly, daughters) to overseas wars that have enriched companies like Halliburton and the Carlyle Group, both because the have-nots are patriotic and because hard economic times make military service a terrific job option . . . at least initially. True, most of the specific charges and larger questions raised in Moore's film are not new, or particularly striking, but to harp on that as Christopher Hitchens and others have done, is to miss much of the point. "Fahrenheit 9/11" is a film; it's a satire, a polemic, an entertainment, and an (ungainly) work of art. To note that it's biased, clumsy, self-contradictory, occasionally adolescent or vicious, is not enough to diminish its signal achievement. Longtime activists and political analysts can quibble at length, but Moore seeks to galvanize the American electorate—the liberals who have felt isolated and overwhelmed, sure, but even more the middle-of-the-roaders who would feel betrayed if they really understood what the Bush Administration has been doing. The movie has a mission and makes no secret of its political aims, but it's also quite funny, quietly astonishing, and genuinely moving. Calmly, respectfully, with a Marine veteran in dress uniform at his side, Moore stands outside the U.S. Capitol trying to get Congressmen to enlist their kids in the military to fight in Iraq. The look one representative gives him is priceless; others hustle away like cockroaches fleeing a light. There are plenty of familiar shots of Bush teeing off or missing a shot on a hunt. Only weeks before 9-11 (at a time when Attorney General Ashcroft was telling the FBI not to bother him with any more reports about potential terrorist activity), the President hangs out on his Texas ranch and talks to the press about armadillos. Some of the sillier material—Oregon State Troopers wearily describing their lack of staff and funding, and puzzlement over how to protect America's borders; citizens of tiny Tappahannock, Virginia trying to figure out why they received reports of an impending terrorist attack ("We have a Wal-Mart"); a cookie-munching California peace group infiltrated by a sheriff's deputy; and an elderly gentleman ratted to the FBI by fellow health club members for criticizing the President and the war—seem too slight to merit the time wasted on them, but their gentle humor may appeal to the political fence-sitters in the audience. The most celebrated find of this movie is a video of the President shot by an elementary school teacher at a Florida class he was visiting when the twin towers were hit. We see an aide inform Bush of the second plane's impact. For a full seven minutes (mercifully edited down), the President continues to sit there with odd, distant, puzzled looks on his face while the children read the book My Pet Goat. He seems to be waiting for somebody to tell him what to do. The effect is quietly frightening. But there are many other startling items. Bing Crosby sings "Santa Claus is Coming to Town" as American soldiers head out on patrol in Baghdad on Christmas Eve. (The music was not Moore's fiendish choice; a boom box was playing it at the soldiers' station next to a makeshift Christmas tree.) The film briefly shows us ghastly wounds and atrocities that didn't come over the networks; a distant, very public beheading in Saudi Arabia; footage of a solitary, youthful George Bush driving a car across the Texas prairie; Ashcroft crooning a patriotic song he composed himself. Audiences have made some of the most audible sounds of disgust watching Deputy Defense Secretary Paul Wolfowitz groom himself for the press by running his comb through his mouth before pushing it through his hair, then licking more saliva onto his hand to smooth his coif. Viewers will be surprised by newsworthy footage that took place in the U.S. but they never saw or heard about: an egg pelting the Presidential limousine along with a protest so large and vehement that Bush was rushed up Pennsylvania Avenue to his inauguration, unlike the leisurely open-air stroll many of his predecessors enjoyed. The procession of U.S. Representatives who sought to debate the Florida election irregularities in Congress when it came time to ratify Bush's election, but couldn't get a hearing because not a single Senator would sign on. (It's particularly puzzling, even painful, to see the President of the Senate, Al Gore, repeatedly rapping the gavel and telling the visiting Congresspersons—most of them female and black—to sit down and shut up because the rules won't allow a debate.) If you weren't glued to C-SPAN, you probably never saw this before, and had already given up on the Florida debacle by then. Why did Gore and the Democrats lie down and let the Bush machine roll over them, one has to wonder. Moore's handling of the 9/11 attack is uncharacteristically subtle and classy. We know the sights only too well, so he gives us a black screen and just the sounds of the attack and confusion, then footage of people looking skyward and consoling one another, and finally a desolation of dust clouds and flying papers. More important, however, is that Moore has chosen to fight fire (the lies of the Bush Administration and conservative talk radio) with fire. I don't think anyone could argue the filmmaker's shadings of truth or inaccuracies are anywhere in a league with those of his political foes, either for size or import. The millions upon millions of dollars that campaign organizations raise every election year do not go toward helping the informed and active citizen make up his or her mind, but to swaying the millions of couch potatoes who get their news from Fox, TV headlines, and their neighbors, rather than investigating the issues and candidates more thoroughly for themselves, and who often feel as inspired to skip the voting booth as to exercise a right people across much of the rest of the globe can only wish they had. Those are the folks Moore's out to ignite, not his "intellectual betters." I am finishing this piece on the evening Monday, June 28, 2004. Tonight Moore participated in a nationwide Internet and speaker phone chat (actually, two; one for the convenience of each coast) sponsored by MoveOn.org, in an attempt to galvanize strong audience reactions to his film in favor of political action. Time will tell whether the energy generated by his film's opening and events like this will be harnessed or will dissipate, but it's clear Moore has made some sort of cinematic history, and whether Bush wins or loses in the fall, Moore can claim some credit not only for a milestone in documentary history, but American history itself. No small achievement for "just a regular guy from Flint, Michigan."